I first discovered Reiki about 6 years after losing my younger daughter Anna, who died at the tender age of 9 and a half months old. Initially I was not interested in how Reiki worked, I simply wanted and needed to feel better about myself and my life. 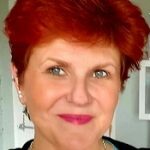 I found having regular Reiki sessions made my daily life more manageable, it took the edge off my emotions and I felt more able to cope with the daily pressures of being a single parent with minimal support, maintaining a full time career, managing staff, running a home and working my way through my grief following Anna's loss. My personal Reiki journey started in 2007, I began to learn Reiki in 2014. I am an now an Angelic Reiki Master Teacher, Usui Reiki Master Teacher, IET(Integrated Energy Therapy ) Master Instructor. I offer Crystal Therapy and Holistic Indian Head Massage and Holistic Facials amongst other treatments. My passion is Angelic Reiki. I absolutely love this very powerful yet gentle Healing modality. In May 2018, I left full time employment to focus fully on my Holistic Therapies. I currently offer Angelic Reiki Treatments and Angelic Reiki Training Courses.